Don't look now but I think the lights just went out! Ah, the Dark Eclipse has finally begun. 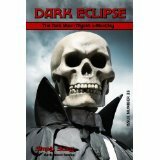 Be the first one to enjoy all the spooky stories and poems in this newest edition put out by Dark Moon Digest. Ebook only so you know it won't cost a fortune. And, it a great treat for those times when only a good scare will do. But please keep one lamp lit for safety sake.